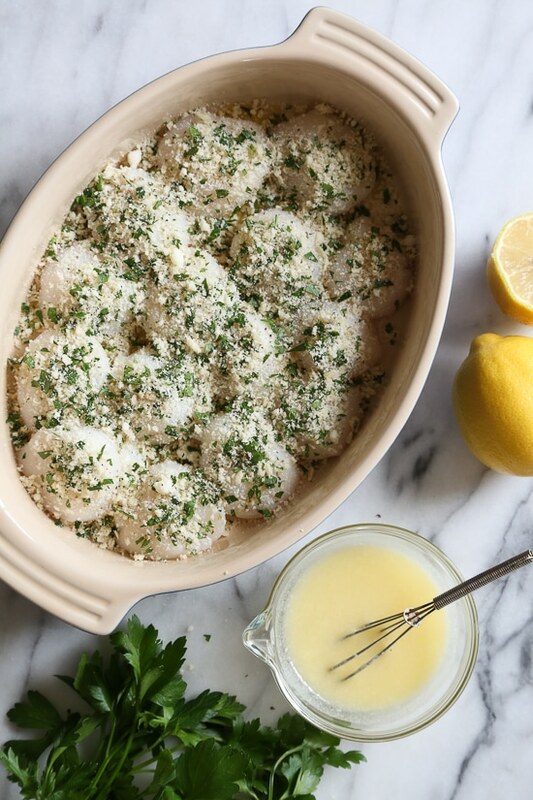 These quick and easy baked sea scallops are topped with panko breadcrumbs and Parmesan cheese in a simple lemon-butter sauce. Scallops are one of my favorite foods, some of my popular scallop recipes are Seared Scallops over Risotto, Blackened Scallops with Horseradish Sauce, and Scallop Tostadas to name a few. I also find them incredibly convenient; they cook in less than 20 minutes, and they go beautifully with vegetables of your choice, pasta or crusty bread. 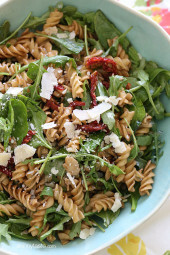 This simple dish is perfect for the holidays as part of a multi-course meal. They’re also perfect for a weeknight dinner, since they cook so quickly. Scallops are good source of protein, B12, magnesium and potassium. It’s best to purchase scallops from a trusted resource that has a good reputation for having a fresh supply of fish. Scallops are extremely perishable, therefore they are usually shelled, washed and frozen, or packed in ice, as soon as they are caught. Fresh scallops should have a white and firm flesh with no fishy odor, with a slightly sweet scent and should be cooked the same day. 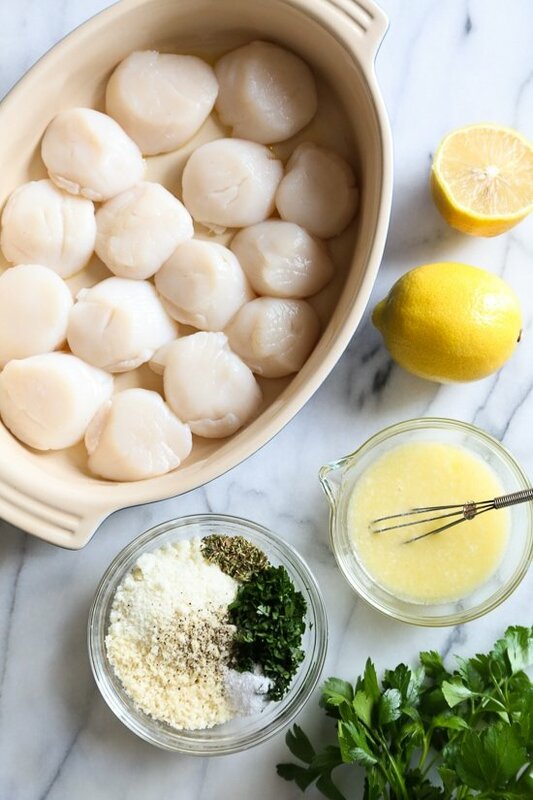 If you are planning on freezing the scallops, make sure to ask the fishmonger whether they are fresh or defrosted since you shouldn’t refreeze previously frozen scallops. To make them dairy free, you can omit the Parmesan and use dairy-free butter. You can omit the wine if you wish. To make these low-carb, swap the panko out for more Parmesan, and reduce the salt. 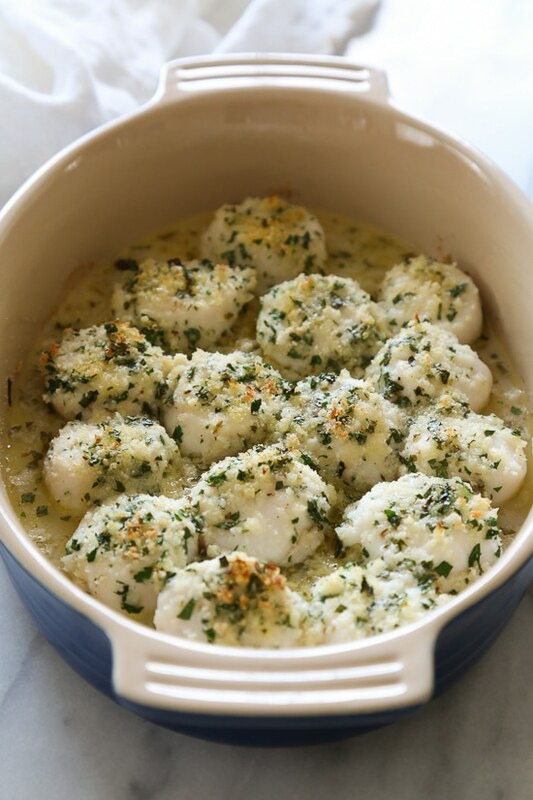 These quick and easy baked sea scallops are topped with panko and Parmesan in a simple lemon-butter sauce. Preheat the oven to 400°F and lightly spray an 8 x 10-inch oval baking dish or 2-quart gratin dish with olive oil or nonstick cooking spray. Pat the scallops dry then spritz them with a little oil, season with 1/8 teaspoon salt. In a small bowl combine the panko, Parmesan, parsley, oregano, 1/8 teaspoon salt and black pepper, to taste. Whisk half of the lemon juice, melted butter, and white wine together and pour over the scallops. Bake for 15 minutes, or until the scallops are opaque. Set the oven to broil on high and broil second rack from the top until the topping is golden, about 2 to 3 minutes. 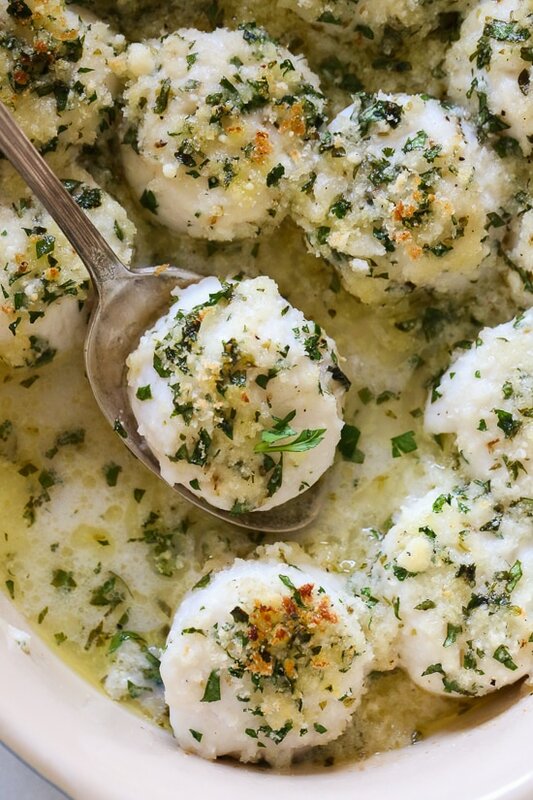 Squeeze the remaining lemon over the scallops and eat right away. Delicious! Scallops so tender and super easy to make! Can this recipe be followed with only (raw) shrimp? Will the shrimp overcook? It was Excellent!! The scallops came out perfect…It was so fast and easy to make. Thanks again ! 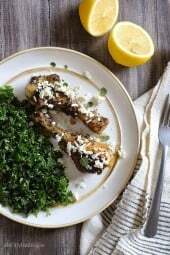 I love this recipe and have made it several time. I tend to add 1 garlic clove crushed to the mixture as well. Very tasty and great macros! The prep is very fast too. I made these for dinner last night and they were INSANELY delicious. Even my husband, who is not a fan of lemon, enjoyed them. I made a side of roasted asparagus and red peppers and it was a perfect meal. Cannot wait to make them again. Made this tonight. Delicious! Very easy, very fast! And the best part of it was that it did not stink up my house like when I pan fry them!! I made them with a side of green beans & carrots – probably would be good with Green Giant riced cauliflower/sweet potato mix. So delicious and I can’t believe it was under 200 calories. I placed them on a bed of steamed spinach and some pearl couscous because I didn’t have bread crumbs. It soaked up the delicious sauce. Yummy-we really enjoyed this. Made it tonight huge hit with the family! I paired it with a low carb pasta, added spinach tomatoes and mushrooms. Absolutely amazing!! Love this recipe. Made it for our New Years Day dinner. I think I may try it with some other fish. We just made this for dinner tonight. Followed the recipe exactly and it turned out great – very lemony which my husband loves….and so did I sort of. Can back off on squeezing the lemon on top after the scallops come out of the oven. Gina’s recipes are awesome. I wondered the same thing. I think the combination of shrimp and scallops would be great though. Does the lemon taste a lot in this recipe? These were a huge hit with us. I bought the small scallops so I’m not quite sure of the serving size or point value. Like every Gina recipe, it was a hit and so flavourful. The best part is how easy & quick it was to make these. I mad this for dinner last night and it was full of flavor and fantastic! Made this tonight. Promised my teenager that if he ate 1 scallop then I would make him chicken tacos. Needless to say, the chicken is still in the fridge. For a side we did a fresh greens salad with feta, chickpeas and balsamic vinegar dressing, which seemed to pair alright with everything. Absolutely delicious! Will try it next time with shrimp too. 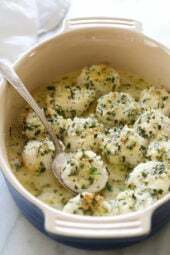 Can this recipe be made with small bay scallops? I have a pound of those in my freezer and would love to try this. I used one pound of bay scallops and mine turned out great! I am only able to get frozen scallops. Should I thaw first or bake frozen? I’m aware of how easily they can spoil. Thaw overnight in the fridge. This was amazing! I added a clove of garlic to it and a load of crusty bread to soak up the sauce. 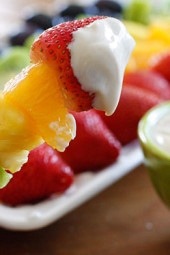 I highly recommend this recipe and we will certainly make this one again! Quick, easy and delicious. Thanks! My scallops are frozen and not the big sea scallops. Should I defrost them before prepping them? Yes, overnight in the fridge. I love scallops and this recipe sounds awesome. What would you recommend as a side dish to this? These look amazing! I love scallops but sadly I’m the only one in my hou that does. More for me then, I guess! I’ll probably throw some shrimp in, too since then SO and SD will eat it! I was thinking about serving with some spaghetti squash.